The Guitar Hero World Tour official press release has hit, bringing with it some lovely news screenshots and tons of information on the next evolution in rhythm gaming to accompany yesterday's debut trailer. Rather than head the article off with one of the shots of people on stage, I decided to showcase the most innovative new feature in the game, the Music Studio, which will allow you and your friends to create your own music and share it with the world. It's pretty much a giant middle finger at the people who love to tell fans of the genre to learn to play a real instrument, isn't it? "I'm making real music, aren't I? Have you composed anything lately?" It remains to be seen how robust the creation tools actually wind up, but with people able to create amazing music using only a Gameboy I have high hopes for this. The game will be out this fall for the Xbox 360 and PS3 from Neversoft, with Vicarious Visions and Budcat doing the Wii and PS2 versions respectively. Hit the jump for the full, info-rich press release. Santa Monica, CA – May 22, 2008 – When the house lights go down this fall, a new generation of axe shredders, drummers and fearless frontmen will come together and rock with Activision, Inc.'s (Nasdaq: ATVI) Guitar Hero® World Tour. The latest installment from the #1 best-selling video game franchise of 2007, Guitar Hero World Tour will transform music gaming by marrying Guitar Hero's® exhilarating guitar gameplay, with a cooperative band experience that combines the most advanced wireless instruments with revolutionary new online and offline gameplay modes. The game will feature a slick newly redesigned guitar, a genuine electronic drum kit and a microphone, as well as an innovative Music Studio music creator that lets players compose, record, edit and share their own rock and roll anthems, along with online Band Career and 8-player "Battle of the Bands." Delivering the largest on-disc set list in a music-rhythm game to-date, Guitar Hero World Tour is comprised entirely of master recordings from some of the greatest classic and modern rock bands of all-time including Van Halen, Linkin Park, The Eagles, Sublime and many more. Additionally, the game will offer significantly more localized downloadable music than ever before on all of the next-generation consoles. Budding rock stars will also be given creative license to fully customize everything from their characters' appearance and instruments to their band's logo and album covers. In addition to a newly designed more responsive guitar controller and microphone, Guitar Hero World Tour will deliver the most realistic drum experience ever in a video game with an authentic electronic drum kit. Featuring three drum pads, two raised cymbals and a bass kick pedal, the drum controller combines larger and quieter, velocity-sensitive drum heads with soft rubber construction to deliver authentic bounce back and is easy to set up, move, break down and store. "Guitar Hero has set the standard for music-based gaming and with Guitar Hero World Tour and the game's groundbreaking Music Studio, we are once again delivering unprecedented innovation that has the potential to revolutionize consumer generated music, much in the same way that video sharing hubs have driven user generated video," said Dusty Welch, Head of Publishing for RedOctane. "With the introduction of our advanced high-quality new wireless instruments, in-depth customization options and advanced online functionality, the game enables music fans and gamers globally to share in the most social and expressive music experience ever." Guitar Hero World Tour delivers more ways to play than ever before. 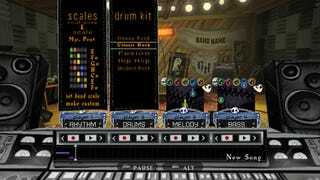 Virtual musicians can live out their rock and roll fantasies by playing either a single instrument, or any combination of instruments, in addition to the full band experience. In addition to all of the online gameplay modes from Guitar Hero® III: Legends of Rock, Guitar Hero World Tour introduces Battle of the Bands mode which allows eight players to join online and challenge each other band-to-band to determine who is the best of the best. In the Band modes, up to four players can jam together, online or off, as they progress through the game, and in single-player Career Mode, players can jam on any of the instruments in branching venue progression enabling them to rock out in the order of their choice. The game's innovative new Music Studio lets players express their musical creativity by giving them access to a full compliment of tools to create digital music from scratch, utilizing all of the instruments, and then play their compositions in the game. Music creators will also be able to share their recordings with their friends online through GHTunes™ where other gamers can download their unique compositions and play them. Guitar Hero World Tour is being developed by Neversoft Entertainment for the Xbox 360® video game and entertainment system from Microsoft and PLAYSTATION®3 computer entertainment system. The Wii™ version is being developed by Vicarious Visions. The PlayStation®2 computer entertainment system version is being developed by Budcat. The game is not yet rated by the ESRB.